የኢትዮጵያ ኦርቶዶክስ ተዋሕዶ ቤተ ክርስቲያን አስተዳደራዊ ችግር በማያዳግም መልኩ ለመፍታትት ሁሉም ይነሳ! 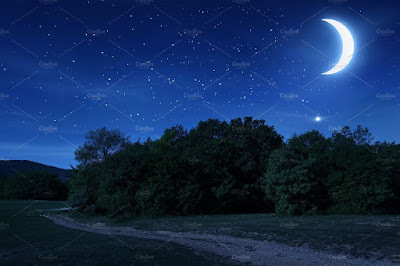 >> የቤተ ክርስቲያን አስተዳደራዊ ችግር መፍትሄ ከውስጥ ይምጣ ወይስ ከውጭ? >> የቤተ ክርስቲያንን አስተዳደራዊ ችግሯን ለመፍታት ማን፣መቼ፣ምን ያድርግ? የቤተ ክርስቲያን አስተዳደራዊ ችግር መፍትሄ ከውስጥ ይምጣ ወይስ ከውጭ? የቤተ ክርስቲያንን አስተዳደራዊ ችግሯን ለመፍታት ማን፣መቼ፣ምን ያድርግ? ለማጠቃለል የኢትዮጵያ ቤተ ክርስቲያን አስተዳደራዊ ችግር ከአሁኑ የግንቦቱ ርክበካህናት የቅዱስ ሲኖዶስ ጉባኤ ወሳኝ መፍትሄ የሚያገኝበት ካልሆነ ከላይ ለመጥቀስ እንደተሞከረው ችግሩ አንዲት የዶሮ ላባ መጣያ ቦታ የለውም።ይህ ማለት ደግሞ ጠቅላላ ምዕመናን በገፋ መልኩ የሚጠይቁበት እና ችግሩ ወደ አልተፈለገ መፋተግ የመድረስ አደጋው ግልጥ ነው።ይህ ደግሞ በሀገሪቱ ላሉ የፖለቲካ እና የጎሳ ግጭቶች ሌላ መልክ ያስይዘውና ጉዳዩ ወደ ተለያዩ ፍላጎት ወዳላቸው አካሎች እጅ እንዲገባ እና መንግስትም ሆነ ቤተክርስቲያኒቱ ሊቆጣጠሩት ወደ ማይችሉት መንገድ ያመራል።ስለሆነም ወግ ባለው መልኩ ምእመናንም ሆኑ መንግስት የቤተ ክርስቲያኒቱ የአስተዳደር ችግሮች እንዲቀረፉ ከልብ ሊነሱ ይገባል።ብፁዓን ሊቃነ ጳጳሳት፣ካህናት ባጠቃላይ፣ሊቃውንተ ቤተ ክርስቲያን፣ሰንበት ትምህርት ቤቶች፣ምዕመናን እና መንፈሳዊ ማኅበራት እንዲሁም መንግስት በሙሉ የቤተ ክርስቲያን አስተዳደራዊ ችግር ለመፍታት የሚነሱበት ወሳኝ ጊዜ ነው። እዚህ ላይ ትዕግስቱ እና ምሕረቱን ላሰፋልን የቤተ ክርስቲያን ራስ አምላካችን ልዑል እግዚአብሔር ምስጋና ይድረሰውና ከአሁን በኃላ ግን እርሱም የዶሮ ላባው ያህል ጥፋት በቤተ ክርስቲያን ላይ የማይታገስበት ጊዜ መሆኑን አውቀን ለማይቀረው አስተዳደራዊ ችግር መፈታት አካል ለመሆን እንነሳ! 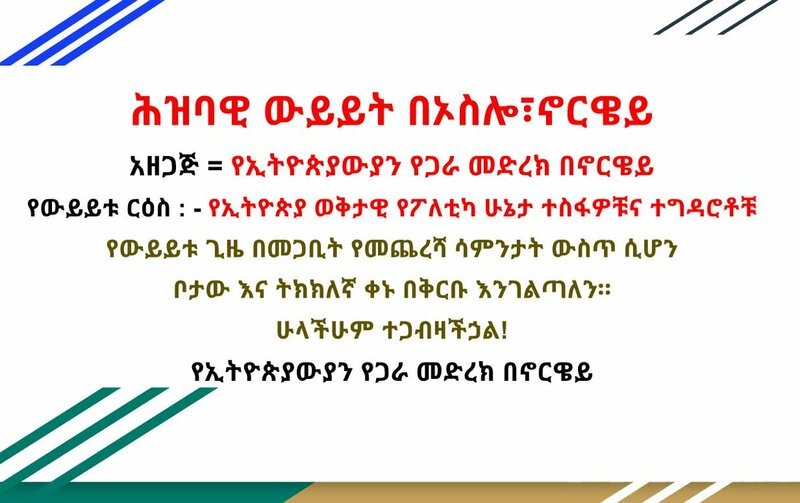 ኦነግ ያለው ኦዴፓ ውስጥ ነው።ኦዴፓ ከኦነግ ጎን መሰለፍህን አሳውቅ! 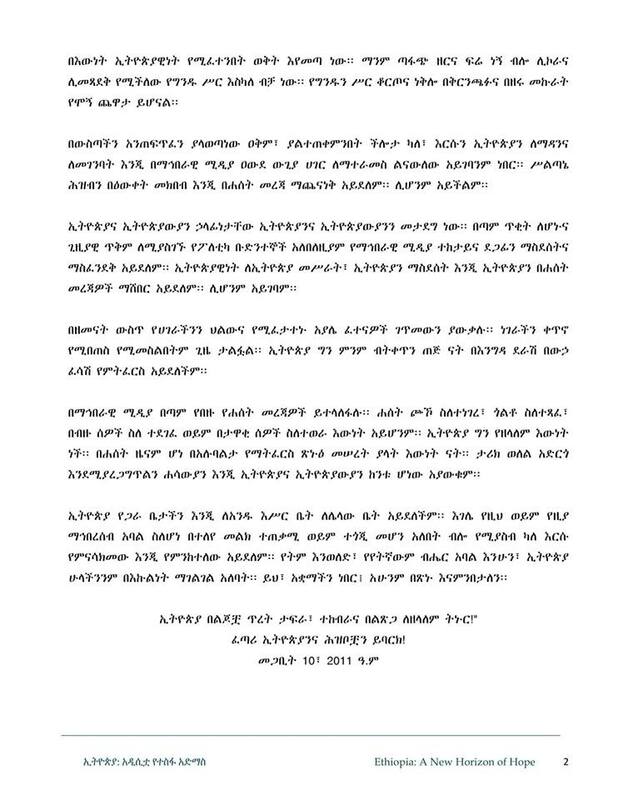 ወይንም ያስጠለልከውን ኦነግ ቆርጠህ ጥለህ ከኢትዮጵያ ጋር ወግን! መንግስት እነኝህን ተግባራት ካላከናወነ ግን በሁሉም በኩል ያሉት የፅንፍ ኃይሎች ኢትዮጵያን ወደ ለየለት የጦርነት አውድማ የመውሰድ አቅም አላቸው።በኦነግ ስም በግልጥ የታጠቀ ኃይል እየተንቀሳቀሰ እና በንፁሃን ላይ አደጋ እያደረሰ በሌላ በኩል ያለው ሕዝብ በዝምታ ያልፋል ብሎ ማሰብ አይቻልም።ይልቁንም ጥቃቱ የበለጠ ሰላማዊ ሕዝብ ወደ ትጥቅ ትግል እንዳይሄድ እና ወደ እርስ በርስ ጦርነት እንዳያመራ ያሰጋል።አሁንም እውነታው አንድ ነው። ኦነግ ያለው በኦዴፓ እቅፍ ውስጥ ነው።መፍትሄው ደግሞ ኦዴፓ እራሱን ከኦነግ ለይቶ በግልጥ ማውገዝ የገባዋል።መንግስት እንደመንግስትም ከአድሏዊ አሰራሮች እራሱን ጠብቆ አሸባሪዎችን መቅጣት ካልቻለ አደገኛ ነው።የዶ/ር ዓቢይ መንግስት በኦነግ ላይ አስፈላጊውን እርምጃ ካልወሰደ ኢትዮጵያን ወደ አደገኛ ብሔራዊ የፀጥታ ችግር ብቻ ሳይሆን በውጭ ኃይል የመጠቃት አደጋም ሊያጋጥም ይችላል።ስለሆነም መሞዳሞዱ ይብቃ! ETIOPISK FELLES FORUM I NORGE (Ethiopian Common Forum in Norway) meeting held in Oslo, Norway on March 30/2019. The former high commissioner and military commander, Dawit Wolde Giorgis, has served with Ethiopian Government for over two decades. He was also an advisor to the UN mission at Rwanda peace and reconciliation program that is as soon as the genocide ended. Currently he is working with International peace and security field. The below article is his assessment regarding the extremist's dangerous move in Ethiopia. I was able to go back to my country after 33 years in exile in Dec of last year. I have thanked the government and the people of Ethiopia for creating the condition that enabled me to go back home. I am an old man by any standard. My purpose in continuing to write about Africa and Ethiopia is to share the wisdom that can only be gained only through age and experience. I have both. I have no other motives. I know some people would not like some of the contents in this article. I have no right or capacity to prescribe any solution but I have certainly the obligation to present and critically analyze the situation. In 1984 during the great famine, the international community viciously condemned the Ethiopian government (dergue) for the resettlement program it conducted. It accused the regime for gross human rights violation. The case was discussed in the UN Human Rights Council and in the US Congress several times. Though the Relief and Rehabilitation Commission (RRC) I headed, was not in charge of the resettlement program, it was responsible for the provision of food to the settlers. The program was condemned for it’s political motivation and for moving the people against their will, though the stated goal of the project was humanitarian. It was to move people from drought affected, highly congested and degraded lands to a more productive areas of Ethiopia, to Wolegga, to Gambela and some to Bale. Looking back, it was indeed amazing how these settlers, mostly from Tigray, Wollo and Northern Showa regions were received. People mostly Oromos were lined up on the streets to cheer and welcome the new settlers. They later helped in the construction of their new homes, invited them to their own homes until they adjusted and helped them in every possible way without any coercion from the government. There was no doubt in anybody’s mind that the welcoming was sincere and in the best tradition of Ethiopians. Those living, remember those days as the best of ‘Ethipiaiwinet’ and indeed it was. 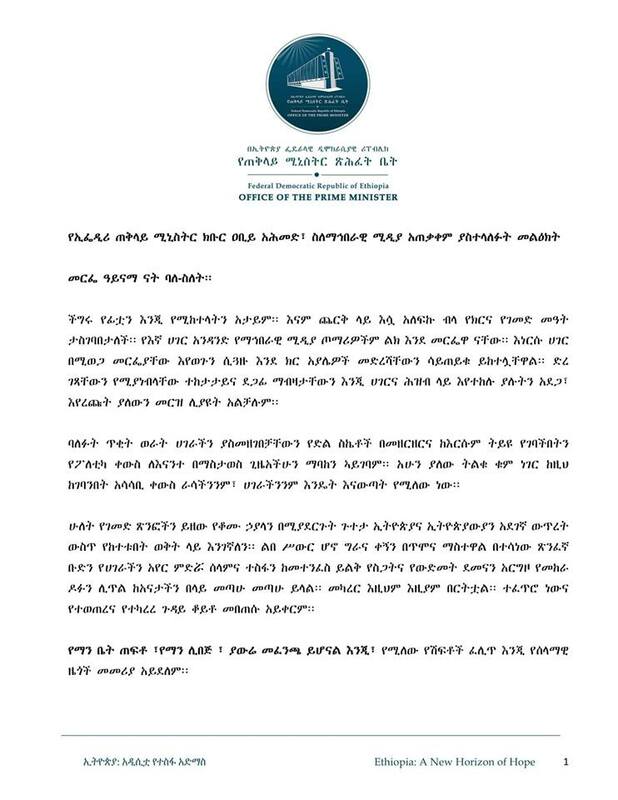 Some members of the international community reported that the program had political motives particularly for those who were moved from Tigray. I have discussed the resettlement in general and this particular project in detail in my book ‘Red Tears page 281 to 308’. There were many such experiments on resettlement in Ethiopia but none were done to change the demography of a given area. The last one was the brainchild of Mengistu: moving 300,000 families (1.5 million people) from Wollo and Tigray to South Western Ethiopia, in nine months. The stated objectives were then purely humanitarian though Mengistu included his own political agenda in this project. The international community was merciless and consistently and strongly condemned these as human rights violations and placed sanctions on the Ethiopian regime. It created an uproar within the international community. There was a very close scrutiny of the activities of the government then, partly because it was the times of the cold war and partly because the government’s (dergue) policies were brutal in many aspects. Fast-forward, and Ethiopia went through a 27-year ordeal that included not only forced eviction and resettlement but also ethnic cleansing, crimes against humanity, suppression of freedom of speech corruption and torture unprecedented in Ethiopian history. And yet the world kept silent. Instead it went on talking tirelessly of the fake economic growth of the nation. Meles was the darling of the West and East and there were little told about what went on behind the prison walls and the booming constructions across urban Ethiopia. It was not because the West did not know because there were several witnesses and independent sources which confirmed the crimes committed by the Ethiopian regime. In 2017 Forbes Magazine wrote about the UN Secretary General Guterres, speaking from Addis at the 28th Summit of the African Union, described Ethiopia as a “pillar of stability” in the tumultuous Horn of Africa, praised the government of Ethiopia and asked the world to show “total solidarity” with the regime. This was being said as the economy of Ethiopia was collapsing under the weight of its own corruption and the wide spread anger and rebellion of the people. The amount of American financial aid received by Ethiopia’s government since it took power: $30 billion. The West, including the so-called global financial institutions like the World Bank and IMF kept on hammering on the myth that that Ethiopia’s economy was the fastest growing economy. Somehow the Ethiopian government escaped the harsh scrutiny of the UN, the US and the international community despite the obvious corruptions, oppression and human rights violations that they now shamelessly condemn while keeping silent while Ethiopian people suffered for 27 years. This year, when Ethiopia and the world were expecting improved governance under PM Abiy and the Lemma Team, the world is once again witnessing gross human rights violations, approved and told publicly by the most senior people in the government. Some of the incidents are happening right in front of the doorsteps of the international community in Addis. These are the forced evictions of thousands of people from the homes they have lived in for over a decade and the demolition of their homes reminiscent of the destruction of houses in the occupied territories of Palestine. People also witnessed the forced resettlement of Oromo farmers and villagers from their ancestral lands to places they have never been, without their consent. The President of the Oromo region Lemma Megersa revealed publicly, boldly and arrogantly that the forced resettlement of 500,000 Oromos was necessary. It was stated that the idea of moving people without their consent to Addis and surrounding areas was to change the demography of Addis Abeba, in favor of the Oromo tribe. It outraged and shocked people particularly because it came from Lemma, the man who was in the forefront of unity and human rights in Ethiopia. The shock reverberated across the nation putting in doubt the agenda of the leaders whom Ethiopians were quick to reward with a saintly image. Besides creating a wave of discontent this action was also a clear and gross human rights violation. The AU, whose head quarter is in Addis Abeba, the international community, the UN and the US have not condemned this blatant violation of human rights of evicting people from their homes and moving people to remote parts of Ethiopia for political reasons. Forced evictions and forced resettlements are human rights violations under international law. Forced and violent evictions and displacements are taking place throughout Ethiopia, and the demolishing of houses by the regional authority in Legetafo is just the latest example. 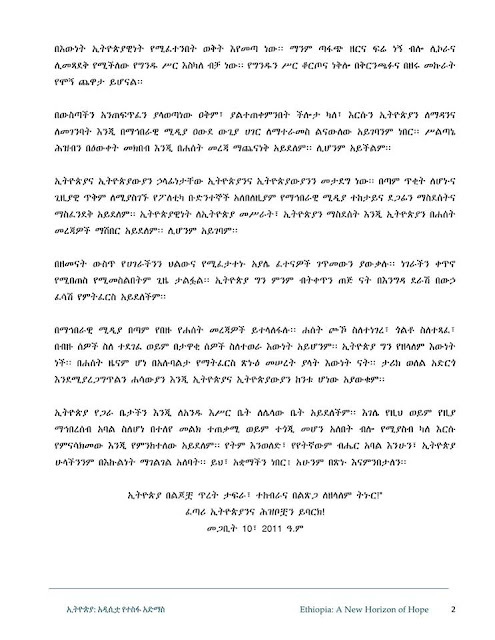 The dispute over the ownership of Addis Abeba, the attempt to change the demography of the capital city and the forced evictions are the most serious problems that can trigger a countrywide unrest. The international community has been largely silent. It is possible that the silence of the international community can be perceived by the Ethiopian government as a green light. 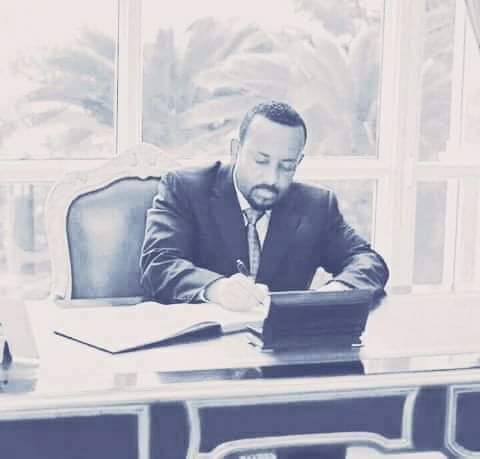 PM Abiy is not a man deserving a Nobel Prize for peace unless he comes out clean from these crimes. There could either be tacit or explicit agreement. But certainly it happened on his watch. It must be remembered hundreds of thousands of people have signed a petition calling for Burmese leader Aung San Suu Kyi to be stripped of her Nobel Prize because of her country’s persecution of its Rohingya Muslim minority. Hate Speech and Radicalization: The Jawar Factor. The government has allowed extremists like Jawar Mohamed, the CEO of the Oromo Media Network (OMN), legally registered in Ethiopia to spread ethnic and religiously motivated hate speech. PM Abiy’s tolerance of Jawar is perplexing. Giving unchecked political power to extremists like Jawar can only further exacerbate the already tense political environment. Some political observers suspect that there is either an explicit or implicit understanding between the PM and Jawar. 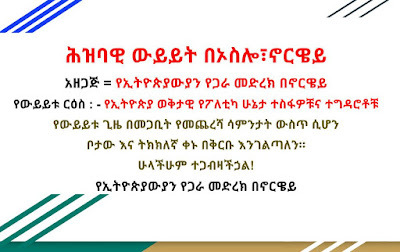 If that is the case, PM Abiy is allowing Jawar’s extreme voice to influence the youth, particularly in the Oromo region. In any other country Jawar would have ended up in prison and prosecuted for crimes of incitements and possibly for terrorism. General Romeo Dallaire, the Canadian commander of the UN peacekeeping operation in Rwanda at the time of the genocide, said: “Simply jamming [the] broadcasts and replacing them with messages of peace and reconciliation would have had a significant impact on the course of events.” His advise was ignored and the UN and the international community regrets with great humility and embarrassment that, had it acted earlier the genocide would probably have not taken place. There is a red line between freedom of expression and hate speech, oratory and incitement. It is well established in the international legal instruments. (iii) create general insurrection in a State. Though the previous regime in Ethiopia defined terrorism to stifle dissent and freedom of expression, there are ways for democratic governments to define it in the genuine interest of the people. The implications of the absence of a universal definition of terrorism for legal purposes are wide-ranging. I believe that Ethiopian government is conducting a study to replace the revamped pervious anti terrorism law. In doing so care will be taken so that the new law does not define terrorism in a manner that can restrict the freedom of people and violate the individual rights of expression, movement and actions. A suitable universal definition is elusive because different governments have different definitions to suit their own particular politics and agenda. The UN and the AU, as indicated above, have established the parameters and for now that should be sufficient to investigate people like Jawar Mohamed for terrorism or crime under the criminal law of the country or deport him to face the law in the US if he is a US citizen. A reasonable government should investigate all the activities, speeches, source of funds, affiliations and their effects on current and future peace and stability and make him accountable through due process of law. Not doing so makes the government itself an accessory or a silent collaborator in what are believed to be serious crimes.